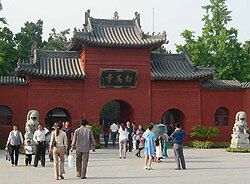 Literally, “Henan” means “south of the river”, the province’s location relative to the mighty Yellow River. Henan is home to China’s most beautiful high areas: the Song Shan mountain range, known for its rugged beauty and ancient trees. The seven-peaked Song Shan is one of the five sacred mountains of Taoism. It also has several Buddhist sites and, most famously, is the location of the world-famous Shaolin Temple, in Song Shan’s western range, the Shaoshi Mountains. From this place of worship came the legendary Shaolin Kung-fu (martial arts).